Walden Pond Press, 9780062104472, 400pp. The Girl from Felony Bay is a fresh, vibrant, funny, and heartwarming debut in the vein of Sheila Turnage's Three Times Lucky and Clare Vanderpool's Moon over Manifest. Set on a southern plantation, it's about a young girl named Abbey, her best friend, Bee, and a hundred-year-old mystery. The last year has been a rough one for Abbey Force. Her father has been in a coma since his accident, in which he was framed for a terrible crime he didn't commit. And their home, Reward Plantation, had to be sold to pay off his debt to society. So Abbey is stuck living with her Uncle Charlie, who isn't exactly an ideal role model. But things just got more interesting. The new family who moved in to Reward Plantation has a daughter named Bee, and she's just as curious as Abbey is about the No Trespassing signs and holes being dug out of Felony Bay. It seems like someone has been poking around a mystery that dates all the way back to the Civil War—and it just might be the same someone who framed Abbey's father. 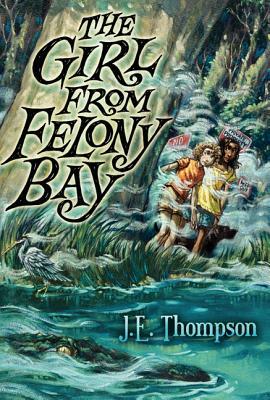 J. E. Thompson is the author of The Girl from Felony Bay along with a number of books for adults. He lives in Charleston, South Carolina, not too far from the bays and plantations that inspire the Felony Bay Mysteries.